While Croatia is best known for Mediterranean cuisine, it’s a diverse country with many different culinary influences. North-western Croatia, Zagreb included, traditionally offered continental food, and there are loads of classic dishes that are still served on a weekly basis. Our local ambassador Iva recommends five foods you absolutely must try when in Zagreb. There’s a really fun and popular song about a farmer called Janko from Zagorje County, a Croatian region near Zagreb. The song says that he should hurry up and get on a train to Zagreb. After all, he won’t miss anything once he gets there, not even food products that are typical of his land, starting with cottage cheese and sour cream. A combination of the two has become a symbol of local cuisine for both Zagorje County and Zagreb. When I was a kid, there were still female farmers who came to our neighbourhood selling just these two simple ingredients, which they carried in giant baskets on top of their heads. I was afraid to even open the door when they rang, not wanting to come anywhere near them because I was afraid the entire contents of their baskets might fall off their heads. They moved so smoothly, though. They were somehow capable of taking some fresh cheese from the basket, wrapping it up, taking the money and, hardest of all, walking up and down the stairs carrying that enormous weight! I still can’t even think of it without imagining them tripping over something. These women can’t be seen walking around the city any more, but you can purchase the same fresh cheese and sour cream at the local farmers market. All you have to do is mix the two ingredients, add some garlic, salt and ground sweet red pepper. Speaking of cottage cheese and sour cream, a mix of these two ingredients serves as a basis for other dishes as well. Štrukli is one of them. It’s a special kind of dough filled with cottage cheese and sour cream. Everyone considers it to be the most Zagreb-like dish there is, which is funny because no one ever prepares it at home anymore. Many restaurants offer it as a dessert, and there’s a cute place called La Struk where they serve nothing but štrukli. 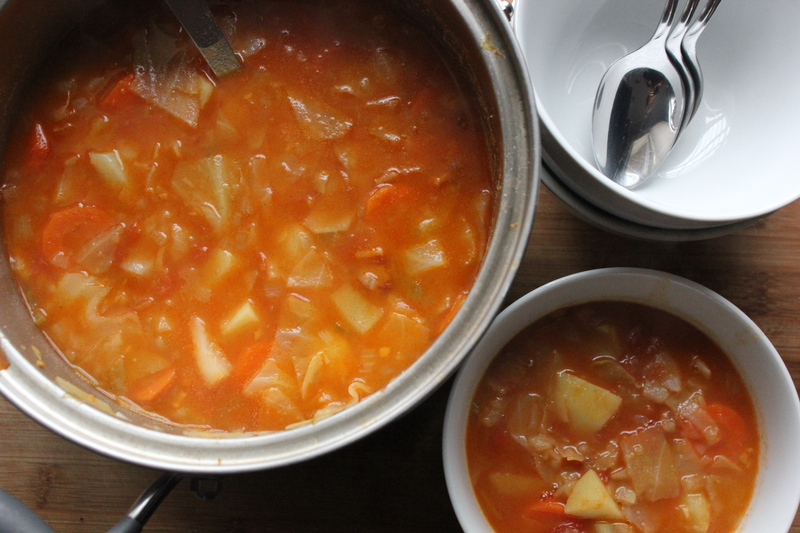 While no one really prepares štrukli at home anymore, cuspajz is something we usually have almost every week. It refers to all sorts of homemade stews featuring a mix of different veggies and some meat. It’s convenient to cook a large amount of cuspajz to feed your family for several days, especially for working families. Schools and kindergartens often serve cuspajz because it’s easy to make and tastes even better when prepared in large quantities. You can try authentic Zagreb dishes like cuspajz at Mount Medvednica. There are so many lovely mountain houses up there that serve local dishes. Locals often hike up there and order cooked beans with sausages – a dish that’s fairly similar to cuspajz. Some places in the heart of Zagreb such as Mestar and Tip-top offer cuspajz at affordable prices from time to time. There are also some places that offer cuspajz delivery, but if you really want to try it, you should just find a friend here in Zagreb and ask him or her invite you over for lunch. Knedli are sweet round dumplings of potato dough that are stuffed with plums or apricots, rolled in breadcrumbs and topped with sugar. You might have a problem finding a place that serves them because they’re usually only prepared at home. Knedli are pretty easy to make though, and they’re a wonderful treat. Even though they’re sweet, people sometimes eat them for lunch. 505 s crtom is a hard candy that you would never want to buy at first sight. When you put it in your mouth, you can’t get rid of it – it lasts forever. The taste is nice, but very old-fashioned, and that’s precisely what’s so great about it! It has been around for generations and it takes us locals back through time. It reminds us of our childhoods, of that little crystal bowl full of colourful sweets sitting on top of a small handmade tablecloth – the only joyous thing in the dull apartment of an old relative we were forced to visit once in a while. 505 s crtom have been produced for almost a century in a famous chocolate factory called Kras, and you can still get them at any grocery store. Kras produces other famous candies too. For example, the first candy a kid ever tastes here in Croatia is sweet and soft Kiki. And if someone wants to impress his or her guests from abroad, they offer a box of chocolates called Bajadera. But 505 s crtom is my personal favourite because it hasn’t changed a bit. It still has the blue line that looks like a sailor’s pale tattoo. That’s what the name implies – 505 with a line. Number 505 is still a mystery, no one knows what it means, but so is the fact that these candies are still being produced. I haven’t seen anyone buying or serving them for years. That’s why it always make me happy when I notice they’re still around. Besides being the author of the Secret Zagreb blog, Iva runs fun storytelling walking tours in her city. She grew up in Zagreb, and makes delicious cuspajz and knedli.